A single dose of the cancer-fighting human papillomavirus (HPV) vaccine Cervarix™ appears to induce an immune response that remains stable in the blood four years after vaccination. This may be enough to protect women from two strains of HPV and, ultimately, from cervical cancer. If these findings are confirmed in larger studies and for a longer follow-up time, not only could the cost of vaccination be reduced, but the logistics of vaccine programs could also be simplified. This is especially significant in developing or isolated regions of the world, where cervical cancer is one of the most common causes of cancer death in women. Mahboobeh Safaeian, Ph.D., of the National Cancer Institute (NCI) Division of Cancer Epidemiology and Genetics, and other NCI colleagues collaborated with Ligia Pinto, Ph.D., and other members of the HPV Immunology Laboratory (Troy Kemp, Ph.D., Gloriana Shelton, and Yuanji Pan) at the Frederick National Laboratory for Cancer Research to examine levels and durability of serum antibody generated by different doses of the vaccine over a four-year follow-up. The work was published Nov. 4 in Cancer Prevention Research. The team of investigators measured antibody levels generated by the vaccine against HPV16 and HPV18, the two virus types most likely to cause cervical cancer, in sera from participants in NCI’s Costa Rica HPV Vaccine Trial, a phase III clinical trial that tested the efficacy of Cervarix in healthy young women. The team compared the level of antibody response in groups of women given one, two, or three doses of the Cervarix vaccine, and in a separate group of women who were not vaccinated but had existing antibody levels from a previous HPV infection. Cervarix is made from virus-like particles (VLPs)—components that make up the structure of a virus, minus any viral genes—rather than from a whole virus. After four years, 100 percent of all women in the study had maintained antibodies against both HPV16 and HPV18. The highest level of antibodies was seen in women receiving the currently prescribed three doses of the vaccine. However, women receiving two doses of the vaccine also had high antibody levels, at 24 times higher than the natural-immunity group for HPV16, and 14 times higher for HPV18. Women who received only one dose of vaccine had antibody levels that were 9 times higher than the natural-immunity group for HPV16, and 5 times higher for HPV18. Antibody levels from three, two, or even one dose all exceeded levels of natural immunity, and all remained stable after four years. “Results raise the possibility that even a single dose of HPV VLPs will induce long-term protection,” the researchers concluded. The Costa Rica HPV Vaccine Trial is a long-standing collaboration between investigators in Costa Rica and NCI. 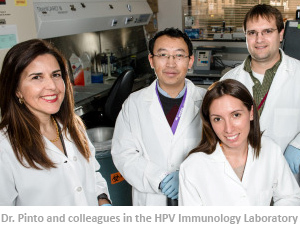 Pinto is head of the HPV Immunology Laboratory at the Frederick National Lab.